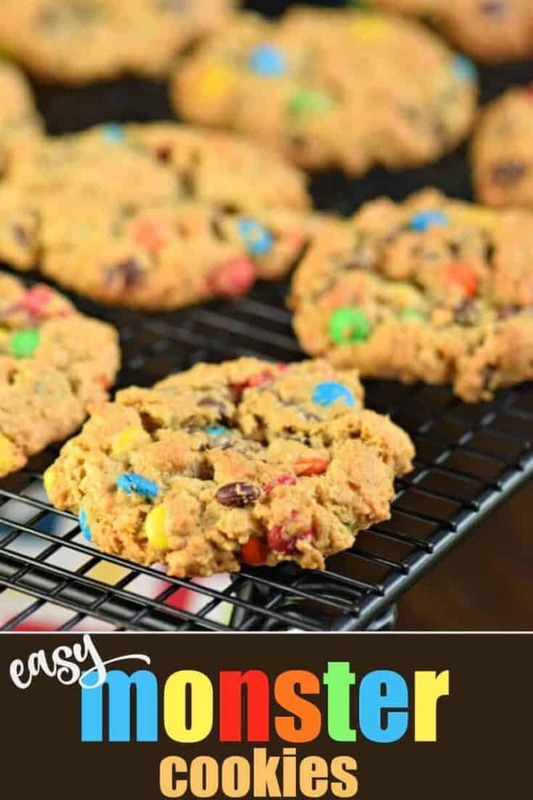 Halloween is just around the corner, so I think it’s only fitting we bake up a batch of Monster Cookies. Okay, fine, there is nothing festive about these cookies, except for the name. 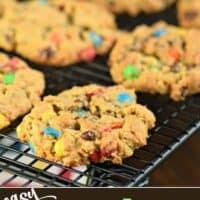 Why are they called Monster Cookies? 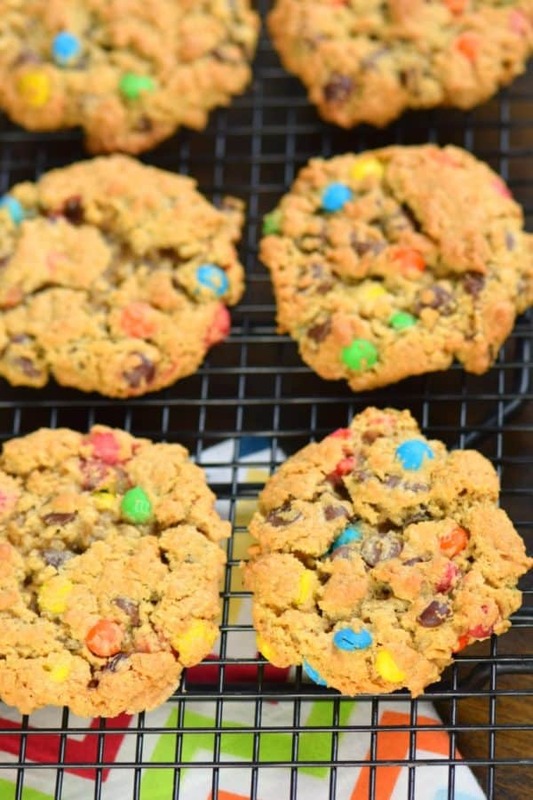 Well, apparently they are called MONSTER COOKIES because they are the “frankenstein” of cookies, a complete mashup! 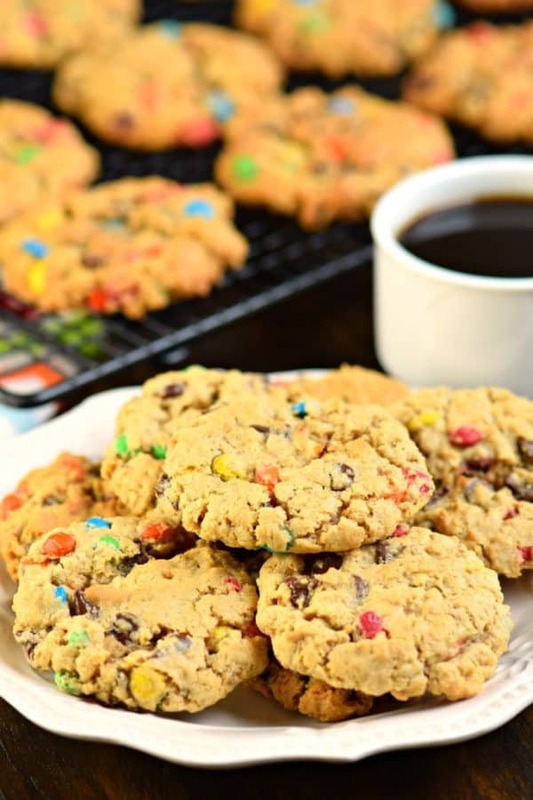 There is great debate though about what you MUST include in order to consider them a Monster Cookie. Frankly, I think any mashup qualifies, but others would disagree. For today’s recipe, I started with a peanut butter oatmeal cookie dough. I added in M&M’S and chocolate chips. Personally, I would have loved to add raisins, but my kids would then develop trust issues and never touch a cookie again. If you do like raisins in your cookies, add a cup of them into the dough! Or bake up a batch of these perfect Oatmeal Raisin Cookies instead! First, start by preheating your oven to 350 degrees F. Line a baking sheet with parchment paper. Set aside. Using a large mixing bowl, combine your butter with brown sugar and granulated sugar. Cream this together until smooth. Add in peanut butter, eggs, vanilla extract (the real stuff), and blend well. Add in your flour, quick cook oatmeal, and baking soda. Combine completely. 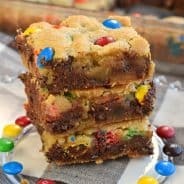 Fold in chocolate chips and M&M’S. Feel free to use holiday colored candies, or any flavor of M&M’S are delicious too, try the pretzel or caramel for a yummy twist! Use a 2 Tbsp scoop and bake cookies for about 12-15 minutes. You’ll get around 55-60 cookies. These freeze really well too. You can freeze the dough balls (place uncooked cookie dough balls on baking sheet in freezer for one hour, then transfer them to a ziploc bag in the freezer until ready to bake). Or freeze the cookies after baking by placing in an airtight container. ENJOY! If you’re looking for HALLOWEEN themed Monster cookies, you’ve got to try these Monster sugar cookies. The recipe uses my favorite cut out sugar cookie dough and is topped with adorable themed frosting! Another delicious Halloween treat would be this crazy fun Monster Cookie Dough Cheese Ball recipe! Don’t forget to add the silly eyeball candy to the mix, kids and adult love it! 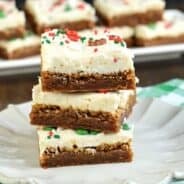 These Monster Cookie Cheesecake Bars are super delicious. You’ll love all the layers! And all the cheesecake fans in the house rejoice! Monster Cookie Dough Cupcakes from Wishes and Dishes are rich peanut butter cupcakes topped with a sweet and loaded cookie dough frosting packed full with peanut butter, chocolate chips and M&M candy! This is the best cupcake recipe ever! 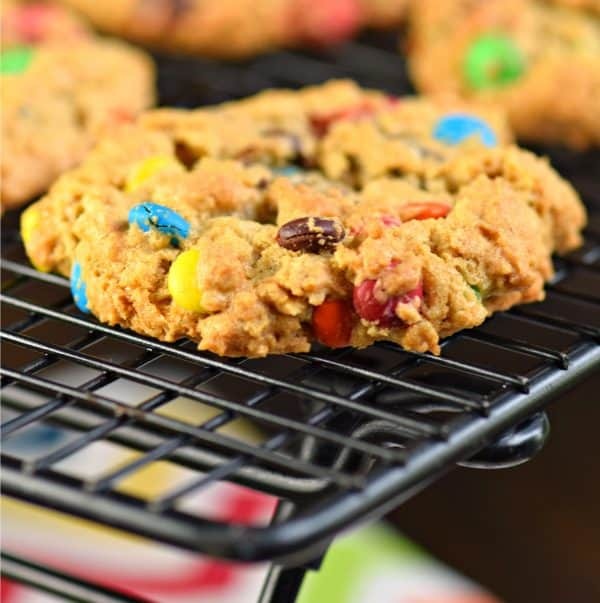 This Monster Cookie Cake from Life Love and Sugar is full of M&Ms, chocolate chips, peanut butter and oats for a cookie cake that is fun, chewy and delicious! Easy to make and perfect for sharing! 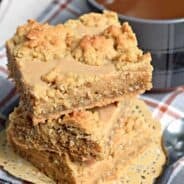 Melt in your mouth, Raspberry Shortbread Bars with a delicious crumble on top! Preheat oven to 350 degrees F. Line a large cookie sheet with parchment paper. Set aside. In a large mixing bowl, beat butter with sugars until creamy, about 3 minutes. Add in peanut butter and beat well. Add eggs and vanilla until well combined. Slowly add in flour, oats and baking soda, mix until blended. Fold in chocolate chips and candy pieces. Using a 2 Tbsp cookie scoop, drop cookie dough onto baking sheet. Bake for 12-15 minutes, until lightly browned on top. Remove from oven and allow to cool several minutes on pan before cooling on a wire rack. Store in airtight container for up to one week. ENJOY! *To freeze cookie dough, drop scooped dough onto parchment paper lined baking sheet and freeze for one hour. After an hour, remove cookie doughs and place in ziploc freezer bag. When ready to bake, add several minutes to baking time. *You can also freeze the cookies AFTER baking by placing in ziploc or airtight container in freezer. To eat, thaw at room temperature and enjoy! I love monster cookies! Great recipe — and great tip on where the name came from. I’m with your kids – my personal motto is never put a raisin where a chocolate chip could go, hehe. Can’t wait to make this one! Thanks, Aimee! I love monster anything! Must be all those fun colors. Gotta try these! Thanks for this great recipe! When you freeze the dough, do you need to thaw them out before baking? Will I need to adjust the baking time? I bake from frozen and just add a few extra minutes to the baking time. I love these monster cookies. I don’t know anyone who doesn’t! !